2019 CISA certification exam training. Try before buy! SKU CISA. 180-Day Subscription to Allen Keele's online CISA certification exam training. Use promotion code"SAVE25" at checkout to save 25%! 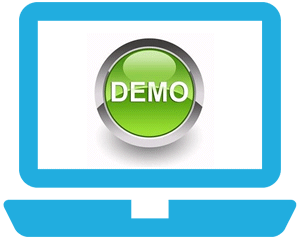 This is simply the absolute fastest and easiest training method to prepare for the CISA exam. Get the same training over 8,200 CISA certification candidates across the world have used to prepare for the rigorous CISA exam since 2006. With this web-based CISA training, you will have 24x7 access to the most recognized and qualified CISA training in the world. Personally prepared, constantly updated, and presented by #1 best-selling CISA author Allen Keele, this course provides everything you need to be able to pass the exam. This training has earned a worldwide reputation for providing everything you need to know for the exam, and delivering the passing score you strive for. With an estimated 30-40 hours required for web-based course completion, you can feel confident this CISA course will give you what it takes to pass the exam. Modules map to ISACA's Task and Knowledge Statements of all five of the 2019 CISA domains. This course already includes the content for the new CISA job-practice areas coming in June 2019. The only CISA course that provides personal support from the globally recognized author of the training. Have questions? Talk to author Allen Keele now at our offices at +1 (904) 406-4311 . Upon successful course completion, a dated certificate for 40 hours of CPE credit is issued to your name. The certificate can be viewed, downloaded, and then printed from your online gradebook. Best Ever Training I had ! I would like to express my gratitude for you for preparing such a nice guide for CISA exam! It focuses on content which is so rich in knowledge. I could correlate them in my day to day job now more clearly. Your teaching method is awesome! I really never such a good training in my entire life! So clear, focused, gives me so much confidence now on the subject. Thank you again for providing such a wonderful program to students who are keen on learning about information security. This course is in an excellent preparation to pass the CISA exam. CISA course material is very comprehensive and exam oriented. I am so glad I found the Certified Information Security Review program for CISA, it saved me a lot of time with the preparation. I passed on my first attempt using the program. Allen has mastered the psychology of teaching complex stuff to people who are new to the subject area. The question bank have the most relevant ISACA approach to the CISA examination. I believe Allen's approach of teaching should be adopted in colleges in every field; it will help students learn concepts faster and better. The customer support was also excellent. Thanks to Allen and his team. 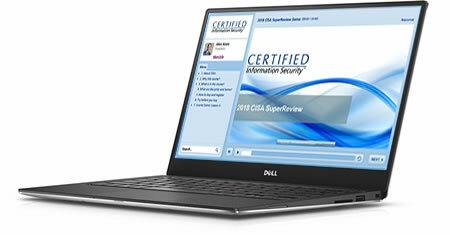 The CISA super review is an excellent product. I relied solely on this for my CISA preparation. I covered the course two times before attempting the actual CISA exam. Allen was a great help and always replied to my queries promptly via email. The day before the exam we had a chat which prepared me for what to expect during the exam. I would personally recommend this course to anyone who wants to clear the CISA exam. I had enrolled for your CISA program. I am glad to inform that I have passed the exam in first attemt. I really want to express my gratitude as the course content is very good and helped immensely for CISA prepetation. Comprehensive Coverage. Super Support. Proven Results. Using Allen Keele’s CISA SuperReview exam training course prepared me to pass ISACA’s 2018 CISA certification exam with a scaled score of 650. Preparing and sitting for the CISA exam is challenging enough without having to worry about how, what, and when to study. And that’s where Allen’s online course came in- helping to keep me focused on important exam content and ensuring I was learning the requisite material. The CISA SuperReview course covered all five exam domains, delivered super support, and provided the confidence I needed to ensure I would achieve the desired results. Commit yourself to a study plan that includes Allen’s online training course and you won’t be disappointed on exam day. Certifiedinforsec will help you pass CISA Exam! I want to recommend 2018 CISA SuperReview to students and recent graduate aspiring for professional certification - Certifiedinforsec will help you pass CISA Exam with training online from Certifiedinforsec.com, it is the most easy to follow program I have ever seen. No text book can help you pass quicker than this site and it's affordable don't waste your time paying some much $$$ or 3 days review. Go there and try the free sample part of the exam! The Best CISA Review Out There! This CISA exam review training is great! Allen Keele definitely knows his stuff and has laid out this training in a format this not only flows well but also puts the information in a relatively easy to understand format. He also knows what the exam expects of you so he is able to frame information in the way that ISACA interprets it. The training is broken up into sections that cover each part of the actual exam as well as a little extra for good measure. The quizzes are great because they phrase them in the way the actual exam does and even peppers in questions that were not specifically covered in the module. This may seem counter-productive but since there will inevitably be questions on the actual exam that were not covered specifically during the training. This will give you a true gauge as to how you are retaining the information and problem solving. If you are looking for IT and/or Audit training, look no further! As long as you put forth your best effort and dedicate yourself, this program will undoubtedly prepare you for your CISA or other intended exam. Thanks again Allen Keele and Certified Info Sec!